throughout the Philippines. The events brought together Google Map Maker mappers across the country to map their communities in preparation of natural disasters. Located in the western Pacific typhoon belt, the Philippines is struck by an average of 20 tropical cyclones every year. As demonstrated by the 2009 Typhoon Ondoy (Ketsana) and Pepeng (Parma), which left much of Metro Manila underwater, the storms are both persistent and devastating. The extensive series of Summer MapUps was organized by mappers from Luzon, Visayas and Mindanao after meeting at the Google Geo User Summit in Singapore. 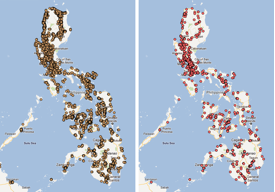 Following in the footsteps of super mapper Rally de Leon, who mapped extensively after the 2009 typhoons, this summer of MapUps was designed as a volunteer project for the Philippine Red Cross. The objective was to map places used during crisis, including health centers, government offices, gymnasiums and public schools used for evacuation. All of the schools (left) and hospitals (right) in the Philippines, as mapped on Google Map Maker. The events kicked off in the Mindanao region, with MapUps in Malaybalay, Bukidnon and General Santos City. Northern Luzon followed with a MapUp in the City of Pines, Baguio City. Baguio City was hit by a devastating earthquake a decade ago, which took the lives of over a thousand people. Volunteers wanted to make sure that they tagged important places, such as evacuation relocation sites, that would help in rescue and relief. A show of enthusiasm from mappers at the Bukidnon MapUp and live mapping in Cebu. MapUps in Iloilo City, Metro Manila, Zamboanga and Cebu City followed. Zamboanga mappers focused on Zamboanga Peninsula, one of the least mapped areas in the Philippines. The Cebu City volunteer mappers were geology students from University of the Philippines Visayas Cebu College. They enjoyed tagging, moderating and editing data, and vowed to continue mapping to complete the Cebu map. Even though summer is over in the Philippines, we will still continue to add map data using Google Map Maker as an effort to help the Philippine Red Cross. If you are interested in hosting a MapUp in your neighborhood, or have other great mapping ideas, be sure to visit Map Makerpedia, which brings together lessons, tutorials and use cases from around the world. We also would like to invite you to join our community of Filipino mappers and help us by improving the map of your neighborhood on Google Map Maker. Mabuhay! This summer, a group of Filipino mapping enthusiasts organized an impressive series of Google MapUps throughout the Philippines. The events brought together Google Map Maker mappers across the country to map their communities in preparation of natural disasters. Located in the western Pacific typhoon belt, the Philippines is struck by an average of 20 tropical cyclones every year. As demonstrated by the 2009 Typhoon Ondoy (Ketsana) and Pepeng (Parma), which left much of Metro Manila underwater, the storms are both persistent and devastating.